There’s no better city than Dublin in which to spend a long lazy weekend; walk along the canal admiring the swans, sup a coffee in town watching the world go by, maybe do a little yoga in the local park. But one of Dublin’s greatest attributes is its proximity to some of Europe’s most beautiful cities. You can fly out on Friday evening, come back on Sunday night and feel like you’ve truly experienced another culture. 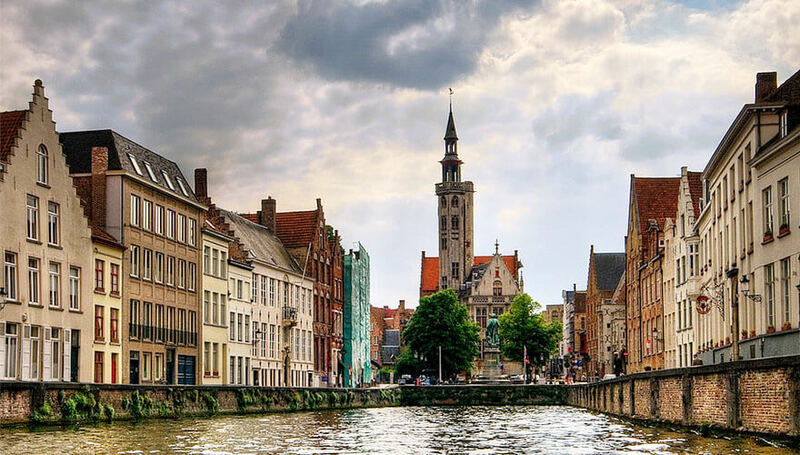 “Maybe that’s what hell is: the entire rest of eternity spent in f**kin’ Bruges.” So says the Colin Farrell character in the Martin McDonagh film, In Bruges – the joke being, of course, that this city is a stunner. Storybook-pretty with stone bridges reflecting in narrow canals, cobbled streets and market squares lined with towers and churches, this is a city with a sepia tinge, best seen in the quieter off-season months when you have the sense that the place is yours alone. The most famous part of Markt Square, built in the 13th century, the belfry tower is 83 metres high. It’s a tight, winding 366-step climb to the top, worth it for magnificent views of the red-tiled roofs of the city. Listen out for the 47-bell carillion of the bell tower, played by hand keyboard on a regular schedule. This stunning port town holds all the slow easy beauty of traditional Portugal with none of the crowded bustle of Lisbon. Set along the banks of the Douro river, the city is best explored on foot. The riverside is lined with seafood restaurants, the streets packed with wine cellars, and the peacock and fountain-filled Jardins do Palácio de Cristal are a perfect lookout point for views of the city’s golden rooftops and vibrant-coloured buildings. 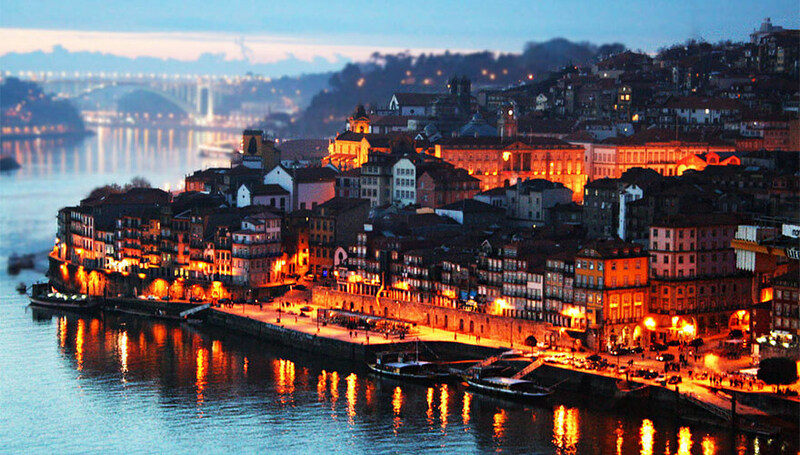 Cross the Dom Luis I Bridge, or take a boat trip to this historic neighbourhood, a World Heritage UNESCO site of medieval alleyways leading down to the pastel buildings and boardwalk of the Duoro riverfront. The Ribeira’s ancient cobbled alleys will lead you to some of the city’s finest restaurants and taverna. 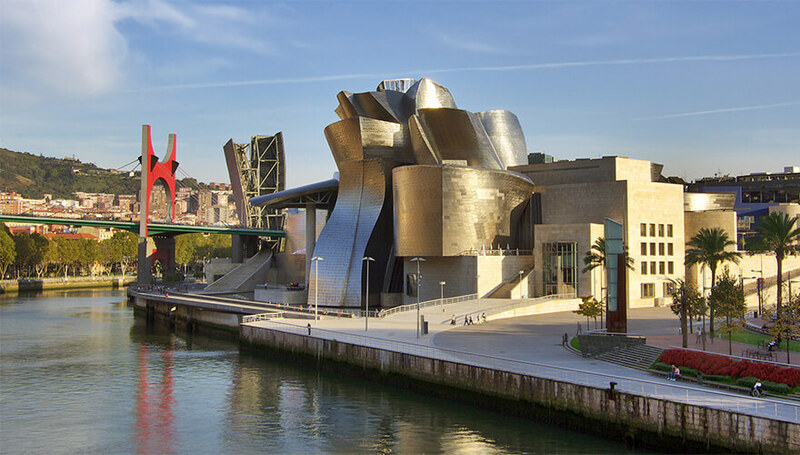 Set amongst lush rolling green hills, Bilbao is the largest city in Spain’s Basque region. Many come here for the art, but this waterfront city is an all-around gem with a food scene that has blossomed in recent years. The Casco Viejo is the city’s vibrant old quarter, made up of Bilbao’s original seven streets, Las Siete Calles, filled with independent boutiques, perfect for afternoon browsing – and the Plaza Nueva, perfect for afternoon grazing. If you crave some sand between your toes, the lively seaside village of Getxo is a couple of euro away on the Metro. This Frank Gehry-designed rippled steel monument to modern art came to Bilbao in 1997 and brought this previously overlooked city to life. The building itself echoes the landscape surrounding the city, but also pays tribute to the port’s history of fishing and shipbuilding, with gleaming ‘scales’ that cloak the structure. Louise Bourgeois’ giant bronze spider, Maman is on the riverside of the museum, and Jeff Koons’ Puppy, a 12-metre tall dog, comprised of begonias, is on the city side. Inside, Rothko and Warhol adorn the walls. 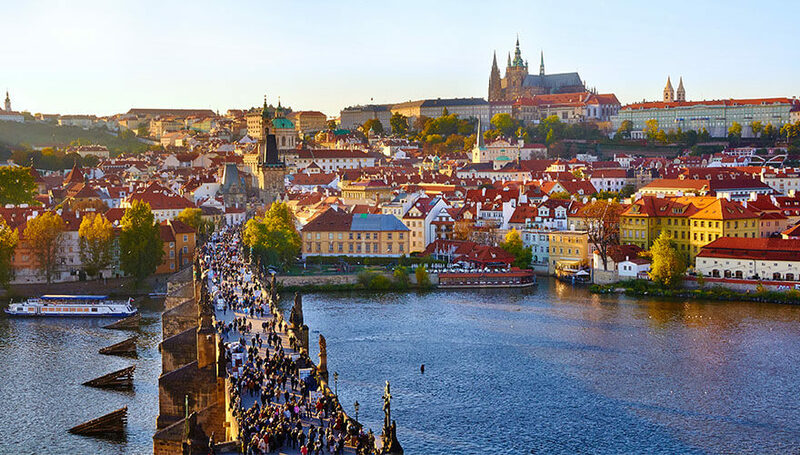 Since the fall of Communism in 1989, the stunning golden city of Prague now takes its place alongside Rome and Paris as one of the biggest tourist destinations in the world. The luxury of it being so near means, you can dodge the high season and take in the city on an idle February weekend, wandering along the misty Charles Bridge among a lesser crowd. With its winding streets and hidden courtyards, Prague is a city built for idle wandering, punctuated, of course, with stops for some of the world’s best beer. You don’t have to go too far off the beaten track for this one. Lined with examples of gothic and baroque architecture, this has been the city’s central gathering place since the 10th century, now home to outdoor concerts, buskers and Christmas markets. Be sure to look up and take in the Prague orloj, the medieval astronomical clock which features an astronomical dial, representing the position of the Sun and Moon in the sky and “The Walk of the Apostles”, an hourly clockwork show of figures of the Apostles and a skeleton representing Death. According to city legend, Prague itself will suffer a terrible fate should the clock ever be put in jeopardy. It always comes as something of a shock how quickly you can find yourself in Paris from Dublin. 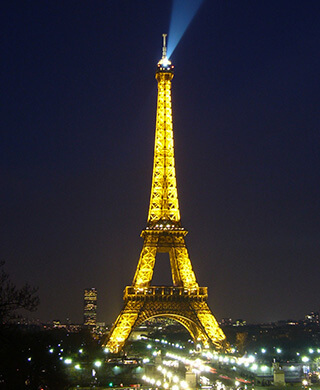 There’s little to say about the attraction of Paris that you don’t already know, almost by instinct: the joy of walking along the lamp-lit Seine, spotting the Eiffel Tower somewhere over in the distance and deciding whether that’s close enough; la la la-ing along to the bells of Notre Dame, buying an overpriced book in the legendary Shakespeare & Company bookshop, just to say you did. And then there’s the knowledge that the world’s most famous artworks are housed in iconic buildings all around you. All this and the fact that you’re close enough to Dublin to bring home a freshly-baked croissant for Monday morning’s breakfast. Only slightly less obvious than the other great attractions, this is the world’s most visited cemetery filled with gorgeous ornate tombs of the rich and famous, the most notable being those of Jim Morrison and Oscar Wilde. Wandering the tree-lined walkways on a grey Paris day among the graves of Chopin, Balzac, Picasso and Edith Piaf is a strangely enchanting experience. Named the European Green Capital for 2019, Oslo is a cosmopolitan hub set within a landscape of mountains and sea. Here, you can have a ramble in nature and do a spot of shopping all in one day. Sample some neo-Nordic cuisine on the city’s thriving restaurant scene, ponder the work of Jeff Koons in the stunning Astrup Fearnley Museet, and then explore some nature – close by are Oslo Fjord’s islands and the ski slopes of Nordmarka. Built on the city’s waterfront, this blue-green glass Opera House resembles a glacier floating on the Oslo Fjord. James Caulfeild, the 1st Earl of Charlemont, was a man who did things with style, and then some. His townhouse on Parnell St, which now houses the Hugh Lane Art Gallery, reflected his elegant, artistic nature, and was initially designed as an adornment to the city, where paintings by Rembrandt and Titian hung. When he embarked upon his Grand Tour - the 18th century equivalent of a gap year - he spent a rather impressive 9 years taking in the delights of Italy, Turkey, Greece and Egypt and became close friends with the future King of Sardinia. As you do.